Deborah Crombie’s 17th novel featuring Duncan Kincaid and Gemma James is on bookshelves now. 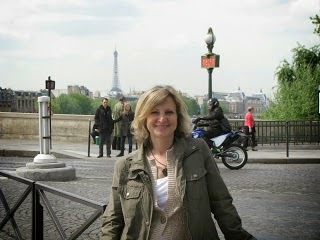 Kerry Hammond, who also reviewed book sixteen, To Dwell in Darkness, is here to tell us about the latest in the series. 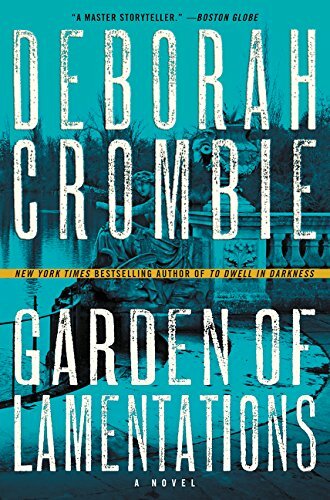 Garden of Lamentations by Deborah Crombie is book 17 in the great series featuring Scotland Yard detectives, and married couple, Duncan Kincaid and Gemma James. It hits bookstores on February 7, published by William Morrow. I read To Dwell in Darkness when it came out in 2015, and I have been anxiously awaiting this next installment to see what Gemma and Duncan are up to. In this book, like most others, the detectives are working on two very different problems. Gemma is connected to a case involving the body of a young girl that was found in a private garden in Notting Hill. The girl is a nanny to one of the children who takes dance classes at the same studio as Gemma’s son. Since she has indirect knowledge of the people involved, she inserts herself into the mix and begins talking to those who knew the nanny. She discovers that there is more to the case that she first thought, and the nanny isn’t the only victim. Meanwhile, Kincaid is knee deep in his own troubles. He is making connections between some cases and suspecting shady dealings by members of the force. He is contacted by an old boss and is warned away from looking into matters further, but Kincaid can’t stop what he’s started. He’s too honest a detective to let the corruption continue, but he’s worried about keeping his family safe if he becomes a target. There is a lot of tension for each of the detectives as they investigate their cases and we see their relationship react to the pressure Kincaid is feeling. He finds himself fighting with and keeping things from Gemma. This strain that they’re under adds to the pace of the plot, making it hard to put the book down. I am a big fan of Crombie’s books, but I came in late to the game and am still working my way back through the books from the beginning. I think it’s important to note that if you picked up Garden of Lamentations you would have no problem getting into the story without having read any of the other books. As with any series, you will learn some spoilers, but that can’t be helped. The characters are what really draws you in and the mysteries the characters are solving keep you reading.